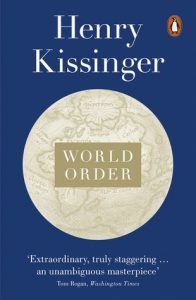 World Order is the summation of Henry Kissinger’s thinking about history, strategy and statecraft. As if taking a perspective from far above the globe, it examines the great tectonic plates of history and the motivations of nations, explaining the attitudes that states and empires have taken to the rest of the world from the formation of Europe to our own times. Kissinger identifies four great ‘world orders’ in history – the European, Islamic, Chinese and American. Since the end of Charlemagne’s empire, and especially since the Peace of Westphalia in 1648, Europeans have striven for balance in international affairs, first in their own continent and then globally. Islamic states have looked to their destined expansion over regions populated by unbelievers, a position exemplified today by Iran under the ayatollahs. For over 2000 years the Chinese have seen ‘all under Heaven’ as being tributary to the Chinese Emperor. America views itself as a ‘city on a hill’, a beacon to the world, whose values have universal validity. How have these attitudes evolved and how have they shaped the histories of their nations, regions, and the rest of the world? What has happened when they have come into contact with each other? How have they balanced legitimacy and power at different times? What is the condition of each in our contemporary world, and how are they shaping relations between states now?